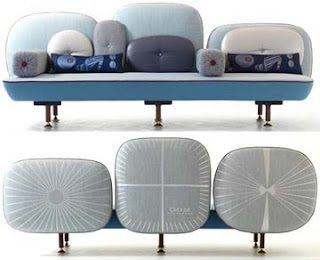 This gorgeous (but, I have to admit not altogether comfortable looking) sofa "draws upon a miniature painting of a Maharani sitting on the floor of her palace, surrounded and supported by multiples of pebble shaped cushions." Which is interesting to me because when I saw it I thought it was inspired by old TVs and radios that you saw in the U.S. in the '60s and '70s. In fact, I also thought the awesome design on the back was a take-off on either an old TV test pattern or radio signal. But either way, it's a gorgeous piece with a unique shape and loads of unusual details. It's called My Beautiful Backside and comes from Doshi Levien. This is indeed an interesting piece of furniture. It's actually not my style at all, but I do like it a lot. And yes, the backside is beautiful. You would have to put the sofa in the middle of the room so you could see it from all angles.